A few days ago, we reported Samsung’s Galaxy C7 Pro’s imminent release in Hong Kong and it seems that the time for C7 Pro’s release in India is close too. 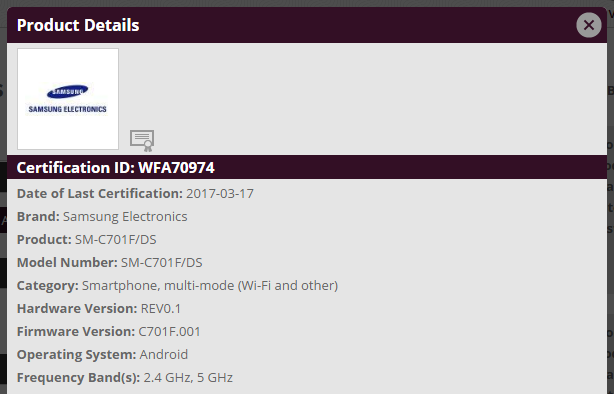 The device today cleared Wi-Fi Alliance under the model number SM-C701F, which in itself is hint that that release is close, but we also discovered that Samsung India already has a support page live for model no. SM-C701F. Admittedly, the content on the support page isn’t exactly on point, meaning that the information provided on it is currently incorrect but the presence of the page further ensures that an Indian release is nearing. Samsung Galaxy C7 Pro comes packed with a 5.7-inch Samsung AMOLED display and 4GB of RAM. Furthermore, the device is powered by Snapdragon 625 processor. The device also includes a respectable 3300mAh battery which should provide it with a full day of use. We should also mention that the C7 Pro is already available for pre-order in China for 2899 Yuan. Furthermore, the 64GB version will be available in four colours- Maple Leaf Gold, Bright Silver, Rose Powder and Smoke Rain Ash. Whether these variants will be available in India is not clear at this point of time.